Firmware compiled from official sources Android Ice Cold Project, It's not a port! Work on 6.0 discontinued!!! The next version will be on 7.1.1. Who like my work and want to support further development, don't forget about donations!!! Thank you: vgdn1942 , Deepflex, Zormax, M.A.D team. I have already run the first Verison on my Vernee and must say that the version already works very well. One should not however keep in mind that the battery life is not very long. In addition, some things do not work, such as the compass, the radio and not the flip cover. 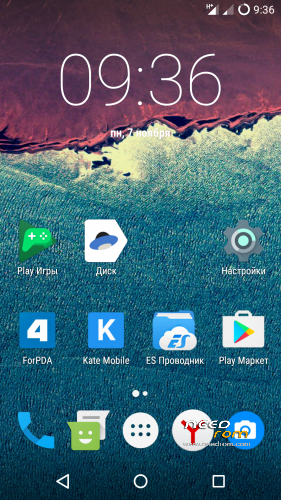 For this I have a clean running Cyanogenmod with Android Ice Cold extensions. I would like to thank Verevka for the great work! In my opinion it is worth developing the project further. I am very positive about the battery life surprised! If I have understood correctly, you use in the project the original kernel of Vernee and the rest is compiled from the AICP sources. If the kernel sources of vernee are released, sure is still possible. If I can afford Hile for your project, I am ready to do it! It would be important to me that the compass would work. Because the sources of Vernee were released, this should not be a problem. It would be great if this would work in the next version. I am otherwise very satisfied with the functionality. Especially the battery life has increased with me strongly. When is the next version to be expected? I have unfortunately discovered an unsightly error. If you activate the hotspot once, the Wlan does not work anymore. No networks are found. I could not fix the error. I have installed the newest stock Rome and deleted all data. Wlan works again and something else is noticeable to me. You can record videos in 4k again. 4k recording is back? YES!!! This was one of the main reasons, I bought this Smartphone. Cheers for your efforts so far, nice to have an option from the stock vernee rom keep up the good work ! Great stuff! Thanks for putting this together & all is working well (apart from aforementioned bugs). Is this a straight upgrade with no wipe ? or full wipe ? just wondered as most roms allow just an upgrade without the hassle of deleting apps and reinstaling !